While measurements of global system properties are often readily obtained, measurements of more detailed local properties can provide a deeper understanding of the system at hand on a microscopic level. However, measuring local properties is often difficult. One solution is to use scanning probe measurements in which a probe is dragged across the surface of the system to create a local disturbance or defect. The effects of this defect can be tracked as a systematic change in a global measurement, allowing one to indirectly reconstruct an image of the local properties. Here, we introduce a new scanning probe tool that allows us to image the location of photons inside a lattice of microwave cavities. In our paper published in Physical Review X and highlighted by a Viewpoint in “Physics”, we study a two-dimensional, 49-site lattice of superconducting microwave cavities that can serve as a backbone for realizing quantum phase transitions of light. The resonators in this cavity are connected via three-way capacitors. 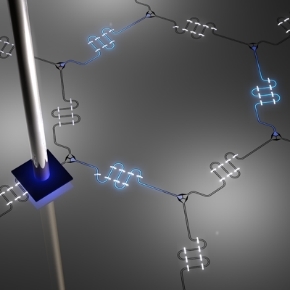 Our scanning probe consists of a sapphire dielectric roughly 2 mm on a side that we bring into close proximity with a lattice cavity, thereby shifting its frequency (by up to 663 MHz) and effectively “poking a hole” in the lattice; the transmission of photons through the lattice depends on the defect strength. By monitoring the changes in transmission of a coherent microwave tone while probing each cavity, we can image the amplitudes of electromagnetic normal modes on each lattice site. Once qubits are integrated into such lattices, mediated photon-photon interactions can give rise to emergent many-body states of light. We note that understanding such states through global measurements alone will be a tremendous challenge. We expect that the local information accessed by our scanning probe will be useful for studying quantum phase transitions.